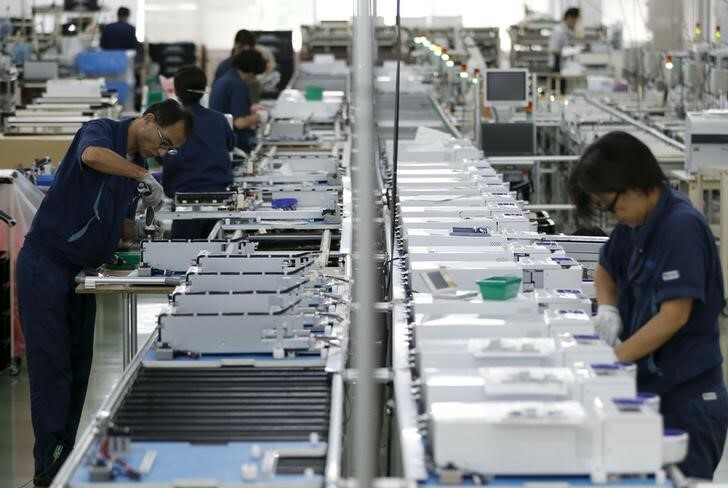 TOKYO (Reuters) – Japan’s factory output likely slipped in September for the first time in two months due to natural disasters, a Reuters poll showed on Friday, which would boost views that the economy weakened in the third quarter. Industrial production was seen down 0.3 percent in September from the previous month, the poll of 16 economists shows. The August figure has been revised to a 0.2 percent gain from the 0.7 percent initially reported. Analysts said that typhoons and earthquakes, which halted operations at some factories, affected the production. The trade dispute between China and the United States may have a more clear impact on Japan’s economy in coming months, they added. Takeshi Minami, chief economist at Norinchukin Research Institute, said the economy “likely softened in the third quarter but capital spending is solid, which may be a support”. “China’s economy slowed and so did global trade. Japan’s economic growth may accelerate again but we are entering the phase that the economic peak out may be coming into sight,” he said. The trade ministry will issue the factory output data at 8:50 am. Oct. 31, Japan time (2350 GMT Oct. 30). Japan will release gross domestic product (GDP) data for July-September on Nov. 14. Retail sales, another key data for gauging third quarter GDP growth, are projected to rise 1.6 percent in September from a year earlier, slowing from August’s 2.7 percent increase, the poll found. Crimping spending were the natural disasters that hit Japan, analysts said. According to the poll, Japan’s jobless rate remained at 2.4 percent in September, and the jobs-to-applicants ratio was also unchanged, at 1.63 jobs per applicant. The Bank of Japan holds a policy meeting on Oct. 30-31. The poll showed it is expected to keep the short-term interest rate target at minus 0.1 percent and the 10-year government bond yield target at around zero percent.